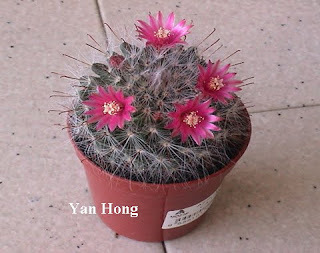 During this Lunar New Year in February, my wife bought three small pots of cacti in Tesco Hyper Market. My elder son brought one of the cacti to Selangor. The other pot of cactus flew to Seoul with my younger son. 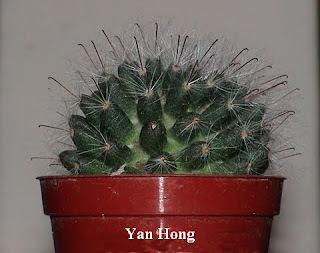 The third pot of cactus was left in my house. One day, I discovered the cactus blooming while I was sweeping the tile floor in front of my house. I was really surprised to see that. I couldn't wait to take a few shots of the cactus. The vitality of cactus is extraordinary. Even if the environment is the utmost badly, the cactus would still tenaciously alive. The cactus symbolizes perseverance and absolutely wouldn't give up easily. The cactus bloomed is very meaningful. It is obviously a delightful achievement after striving seriously. It's not mine but it's ours. It's so sorry that I am not a cactus expert. It's not expensive. The price is only a few ringgit.